The words a, an, and the are generally called articles and sometimes classed as a separate part of speech. In function, however, they can be grouped with the demonstrative adjectives that are used to point things out rather than describe them. A is called the indefinite article because it points out an object, but not any particular specimen. When do we use “in” “on” in citing dates. we use “on” when followed by a complete date: i was born on august 1, 1980.
we use “in” when followed by an incomplete one: pope john paul II visited manila in january 1995. The given “explanation” of articles is so inaccurate as to be harmful for students of English. The examples are all correct sentences and usages, but the reason for the choice of article has little to do with specificity or particularity. To wit: We say, “I’m going to the store” even when the speaker is unsure of which store, and we say, “This is a ____” to introduce a specific item (one that we are holding, for example). The truth about articles is much more complicated than the erroneous “general and specific” explanation. Check out the article chapter in The Grammar Book by Larsen-Freeman and Celce-Murcia for some insight. I would like to know as how to understand the letter is silent in the word . i have asked many trainers but got no reply. pls help me in. 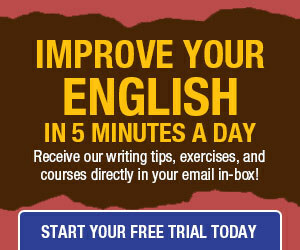 i want to improve on my writing skills……..how can i do that???? You chose a sticky one for your Grammar Test II. 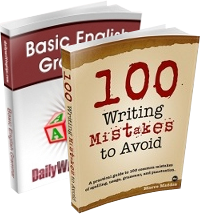 Euphemism has a vowel glide as its beginning sound and should take the article a, not an.